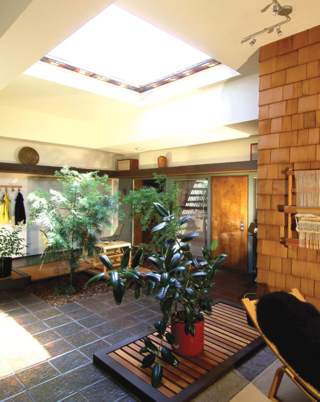 Sacramento's Streng homes typically have three small skylights as well as an oversized atrium cover, as above. Done-Rite Roofing's Fred Drees measures the raised curb of this Streng skylight on his Johns Manville single-ply install in preparation for a replacement skylight. Three small tubular skylights funnel light into the Streng below. The majority of residential skylight issues stem from improper installation. It's always best to get a professional involved. "It's not difficult if you've done a few hundred installations on several types of roofs," says Fred Worrell of Worrell Roofing, a modified bitumen roofing installer in Palo Alto. In addition, a licensed professional, such as a roofing or general contractor, will ensure that you get the proper building permits, which are required for all new skylight installations. If you're just replacing an existing skylight in a bathroom, a permit may not be required. Electronically operable retrofits require a permit because you need to get an electrician involved. A licensed contractor will also assure that the installation meets fire setback rules and determine whether or not the curb should be sloped. Plus, he or she will have the necessary workman's compensation and liability insurance. "Roofing is dangerous work," Worrell cautions, "and homeowners and non-roofing contractors are at great risk." When installing skylights at a time other than re-roofing, take special precautions so that the integrity and warranty of your roof are not compromised. But how will a skylight installation impact the type of roof system you have? Skylights can be added at any time to existing foam roofs without worrying about leak issues, says Rick Abril—as long as it's done in conjunction with an experienced foam applicator. "You can reseal any penetration on a foam roof with new foam seamlessly," he says. 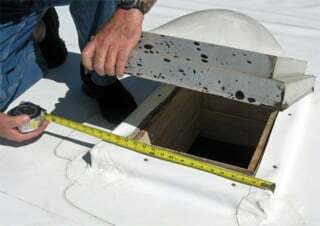 Proper skylight installation on membrane-style roofs, such as a modified bitumen, requires ample flashing that reaches high enough for the skylight frame to cover the curb. That's why Worrell recommends that homeowners install their skylights, even replacements over existing openings, when they are renewing their modified-bitumen roofs. "Not only is it more cost effective at that time," he says, "but it's also a time when skylights can be lifted off and inspected, and provides for a clean working surface. 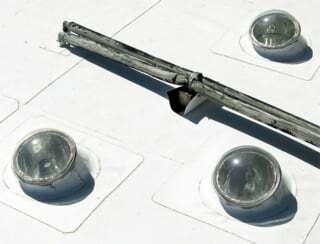 This allows the contractor to accurately measure the curb so that you get the best-fitting skylight." Done-Rite's Drees, who installs the single-ply Johns Manville system on Streng homes, says skylights on his Streng roofs can be installed at any time. However, since Strengs typically have three small skylights as well as an oversized atrium cover, "It's all a money thing," he says. "For someone who has the budget, the best scenario is certainly to add or replace skylights when you're doing the roof, but not everyone can do that." The type of roof you have will help determine when an operable skylight will be most beneficial for cooling. For instance, tar and gravel roofs can get so hot during the day that you won't want to open the skylights until the evening. On the other hand, foam and other cool roofs reflect light, so you can open skylights on those roofs pretty much anytime without fear of letting in excessive heat from the roof.